No we don't intentionally drown tourists, this is something they pay for. Drive around the streets of London then into the river for a quick whip around and back on land again. Duck boats in London? I can't figure out which is worse, riding this thing down Cheapside, or vomiting over the side if the tide is coming in. A Dukw! Brilliant! There used to be one at Portobello Beach but cost to much for us to attempt to get on. What a laugh! Nice way to cool down on one of those hot summer days in London! We have buses like that in Montreal too, we call them amphibuses, 'amphi' for amphibian! There used to be one that took you over to Caldy Island in West Wales...brilliant. They had tour boats like these in Chicago when I was working there. I never took one but, many people did. I had no idea they had them in London. 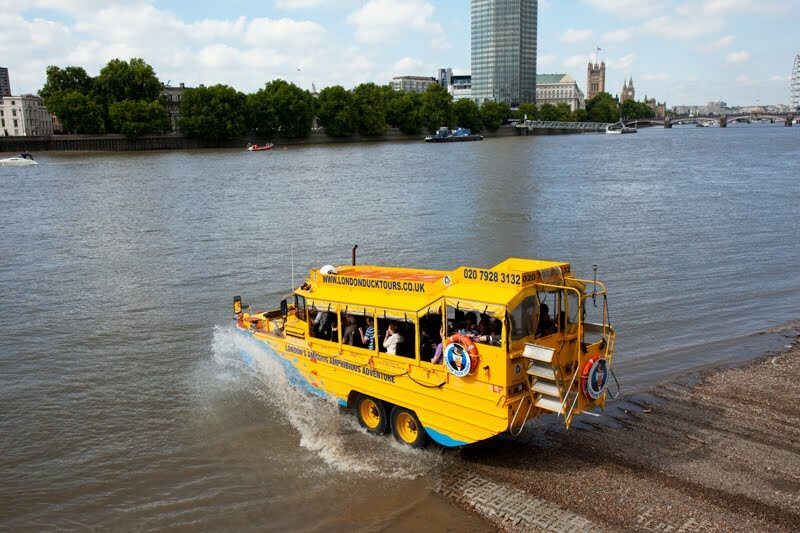 Ooo, I've done a duck tour. It was great except I had very bad morning sickness at the time which made it less fun that it should have been. Hmmm, not sure I'd want to get wet with that water, how clean is the Thames? We did this on our last visit to London in March. A bit chilly, but very fun! We took the special WWII tour, which was really interesting. I've seen this but not been on it. It does look like fun! In Boston they are called Ducks. I have never taken a duck tour. You do pick such interesting things to show us.Mind you, can't help thinking 'What's wrong with a boat? '.